One of my besties is expecting a baby. She and her husband call the baby in her belly Baby Osito. 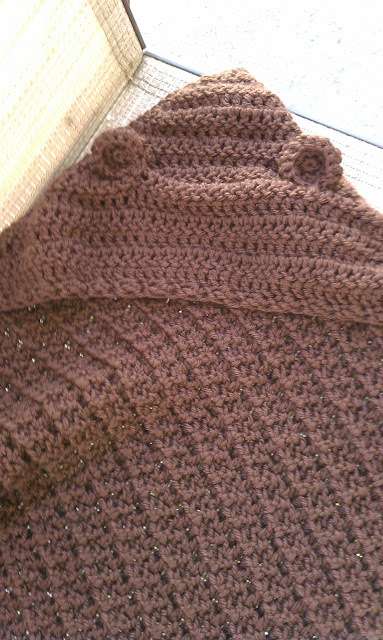 Because she crochet (pregnancy carpel tunnel), I've been working hard to anticipate what she might like. 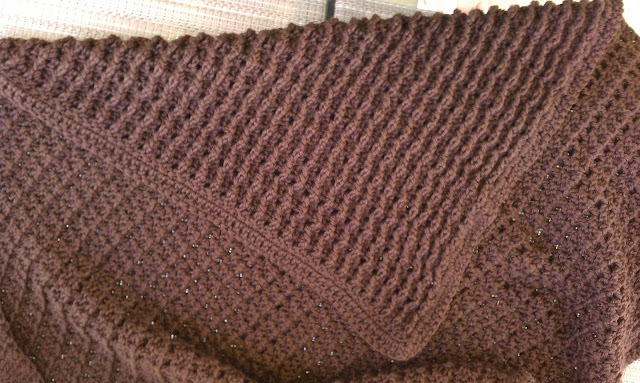 One thing I knew I needed to make was a baby bear blanket. I'll be honest. I was intimidated. There are a lot of patterns out there. Many are very adorable. In the end, I created my own. It is designed as a blanket with a hood. The pattern that is created uses alternating FPDC and DC to create ridges. The top (V) is the alternating ridges. 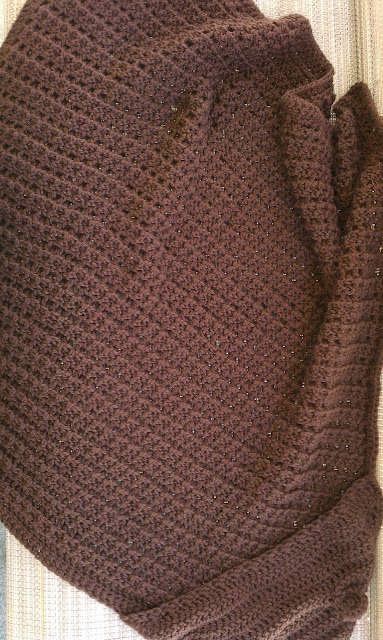 Below is the inside of the blanket. Row 1: DC in the 4th chain from the hook and in every chain across. Chain 1 turn. 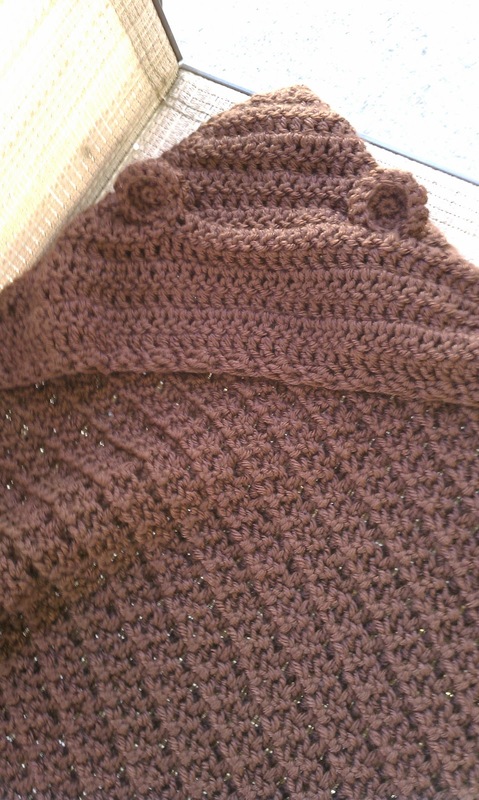 Row 2: SC in the same stitch and in each stitch across (99 sc). Chain 3 turn. Row 3: The turning chain counts as your first DC. FPDC around the second SC stitch. DC in the third. Alternate FPDC in one stitch and a regular DC across. If you do this correctly, you should end in a DC in the top of the turning chain.Chain 3, turn. Row 4: The turning chain counts as your first DC. Back Post Triple Crochet (BPTC) around the next stitch, then DC in the third. Alternate BPTC and DC across, ending with a DC in the top of the turning chain. Chain 3, turn. Continue alternating rows until you have 52 rows, ending with a repeat of Row 4. At the end of Row 52, chain 1 and turn. Row 53: SC across. Chain 3, turn. Row 54. DC across. Fasten off. I went back and completed the border by crocheting a row of SC followed by a row of DC on each side, making sure to crochet 2 DC in each corner stitch and attaching to the top of the DC from the adjoining row to complete the border around. I used a pattern from Lion Brand for one of their hooded blankets. I used a set of ears from another pattern as well.